— The Siegessäule (victory column), is a Berlin monument and popular tourist attraction that commemorates Germany’s 1870 victory over France in the Battle of Sedan. That battle ended the Franco-Prussian War and, as a result, Germany became a nation state. In 1873 Kaiser Wilhelm I unveiled the monument, which served as symbol of German unification. Its proportions were inspired by Karl Friedrich Schinkel’s neo-classical architecture. In 1939, the Siegessäule changed. Adolf Hitler moved the column from its original location in front of the Reichstag to where it now stands at the center of the Großer Stern roundabout in Berlin’s Tiergarten. He placed it along an east/west axis running through the city that the Nazi troops were supposed to traverse on their victorious return from Russia. Albert Speer broadened its base and added another section that made it taller than before. Walter Benjamin’s memoir, Berlin Childhood Around 1900, opens with the inscription “Oh brown baked victory column with winter sugar from the days of childhood.” With this Benjamin suggests that, in winter, the monument resembled a gingerbread house covered with confectioner’s sugar—perhaps one that his mother had baked for him. I discovered Benjamin’s memoir in 1993, shortly after coming to Berlin for the first time with my husband and young daughter. It comprises forty-two short texts that describe vividly remembered places and events from Benjamin’s childhood. Benjamin started writing it in 1932, shortly after leaving his beloved city for what he feared would be a prolonged exile. He considered this project an inoculation against homesickness. The entries are more allegorical than autobiographical—covering such themes as love and loss of home, hunting and being hunted, the lure of exotic places and a passion for reading and writing. His text, Die Siegessäule, reflects his aversion to the monument by describing the symbolic mosaic that covers its interior and the celebratory military parades that he was forced to attend. From 1993 until 2001, whenever I was in Berlin, I shot photographs based on these image-rich texts—texts which Benjamin himself described as snapshots of a bourgeois childhood. Sometimes this was as simple as going to a location he mentions or photographing events from my daughter’s life at school and with friends. For an exhibition of this work at the daadgalerie, I decided to commission a baked version of the victory column. First, I planned to give the baker a souvenir of the monument to copy. However, searching through tourist shops and antique markets yielded nothing. At the victory column itself only souvenirs of the golden angel that sits at its top were for sale. Curiously, the base of the victory column houses an exhibition of models of monuments from around the world—in sharp to contrast its own souvenir-less status. In response, I produced a small edition of victory columns. They were ten inches tall and based on the original version, before Hitler’s enlargement. They served as prototypes for a subsequent edition of 1000 that I made for the 2004 Berlin Biennale. The word “souvenir” derives from Latin “subvenire”, which translates “to come up from below”—virtually the same as its meaning in French. Souvenirs are a way of remembering, holding on to memories, so that they remain present. 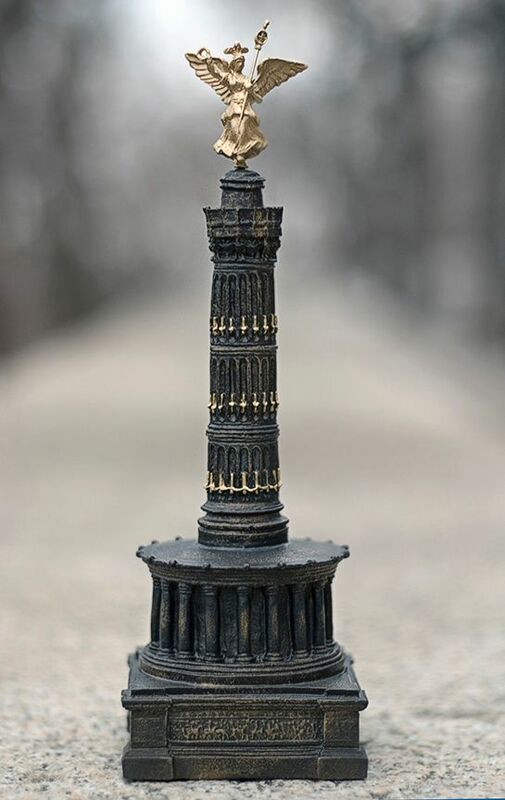 The absence of a victory column souvenir suggests the opposite—a desire to repress not only memories of the monument, but also its troubling past. As far as I know, my edition may be the only group of Siegessäule souvenirs available anywhere. Only Die Siegessäule, Berlin’s leading gay and lesbian magazine, deigns to acknowledge this symbol, admittedly with a degree of irony. My desire to produce an edition of souvenirs is not so much a celebration of the monument as it is a way to confront its traumatic history. Aura Rosenberg received her BA from Sarah Lawrence College and her MFA from Hunter College, NY as well as attending the Whitney Museum of American Art Independent Study Program. Her work has been exhibited at, among others, Museum der Moderne, Salzburg, Austria, Le Magasin, Centre D’art Contemporain, Grenoble, France, Institute of Contemporary Art (ICA), Philadelphia, Julia Stoschek Collection, Düsseldorf, Frankfurter Kunstverein, Frankfurt, Hamburger Banhof, Berlin, Temporäre Kunsthalle, Berlin, Swiss Institute, New York, Fotomuseum Winterthur, Zürich, MAMCO, Musee d’art Moderne et Contemporain, Geneva and P.S.1 Contemporary Art Center, Long Island City.